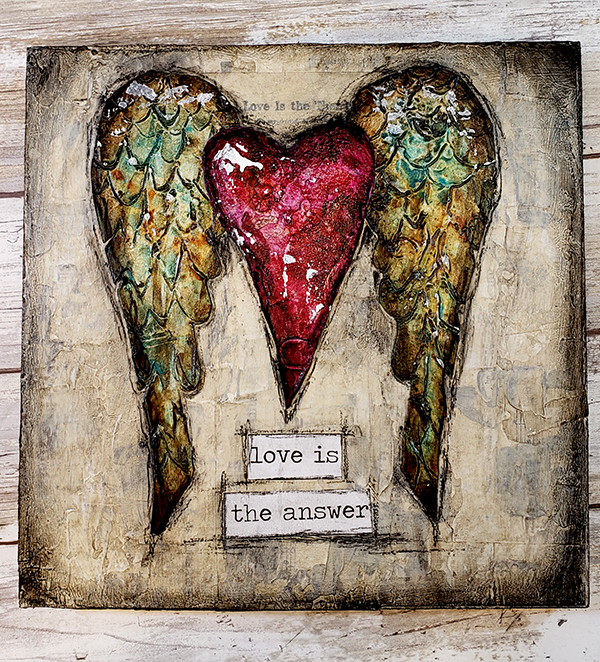 Since February is all about love, hearts and reds, I thought I would put my grungy spin on a Valentine gift for a family member. I wanted to create something that had a lot of texture and the wings were perfect to create texture with the feathers using Modeling Paste and Gesso. Once I saw the lovely texture I knew that the heart had to have some too! Add some layers of fluid acrylic creating a rusty aged look and some Crackle Paint and it was perfect! I hope you enjoy the video. Be sure to visit Shawn Petite - Art. Workshops. Tools to help you create for more projects and to learn more about Shawn Andrews. Great idea with the texture on the wings! I'll have to try mixing gesso with modeling paste as you suggest. Thanks so much! Thanks for sharing your techniques of pushing and pulling the mediums to get the texture to stand out, yet integrating the layers. Looking forward to sharing in my classes! Love the sparkle of white gesso at the end for emphasis on the focal point! Project inspiration from around the world, educational videos, and product announcements. Get daily email updates when there are new posts.